Recently All You and Genesis Today sent us coupons to try out three versions of their Genesis Today Juices. These are not your average concentrated juice. This is basically your daily vitamin and juice all mixed together which is perfect for me. I have a bottle of vitamins that is probably 3 years old because I can never remember to take them. We had to go a little out of our routine because these are only sold at Walmart. Grabbing the juices I was also a little shocked at the price, $6.99 a bottle. There must something good in there at that price! Each one has a different blend of vitamins and nutrients to help with different things and each has a very different taste. Acai Berry was our favorite. The bottle states that it supports healthy skin, hair and nails, weight control, energy and endurance, aging and longevity. It’s fairly sweet and was liked by everyone that tried it! It is a little think with sediment in the bottom so shake well. Reservatrol, helps support cardiovascular health, youthful energy and appearance, and healthy inflammatory responses. This was second place for us next to the Acai. It is very sweet and has a little after taste (their website says “That’s the good stuff in it!”). It tastes a little like wine being grape based. Goji Berry, a blend to support mood, mind and memory, eye health, endurance was our least favorite. Though not bad by any means it just wasn’t a normal taste for us. It has a carrot juice flavor and looks a little like it too being orange in color. So now it’s your turn to try it! 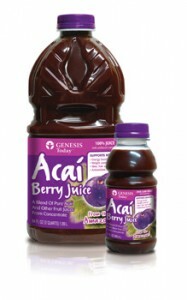 The first 200 to enter will get a coupon for a FREE bottle of Genesis Juice. Entering below your address will be shared with All You so that they can fulfill shipments. Only one entry per household. Over All Bottles are Taken! !